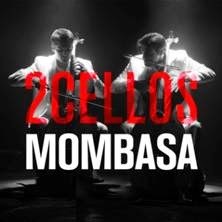 2CELLOS release a new music video for “Mombasa,” an exhilarating track from the Inception film soundtrack. The 2CELLOS were inspired to create a modern and minimalist look for this video using a black and white color scheme. Check it out here. Their rendition of “Mombasa” is available for purchase as an audio track at all digital service providers. The 2CELLOS will perform “Thunderstruck” on The Late Late Show With Craig Ferguson on May 22nd at 12:35am EST / 11:35pm Central on CBS. Luka Sulic and Stjepan Hauser of the 2CELLOS are best known for re-imagining pop and rock tunes performed on their cellos. The Croatian duo recently embarked on a successful sold out tour of Japan and a just finished a Las Vegas run with Elton John performing in his spectacular show at Caesar’s Colosseum. They have released two albums – 2CELLOS and IN2ITION – which are available on Sony Music Masterworks. They were the first instrumentalists to ever be featured on Glee and have also appeared on The Ellen DeGeneres Show, The Tonight Show and others. They were most recently featured in The Bachelor Live Wedding Special. More for your ears, times two!